Supporting Boy Scouts, Girl Scouts, and more! 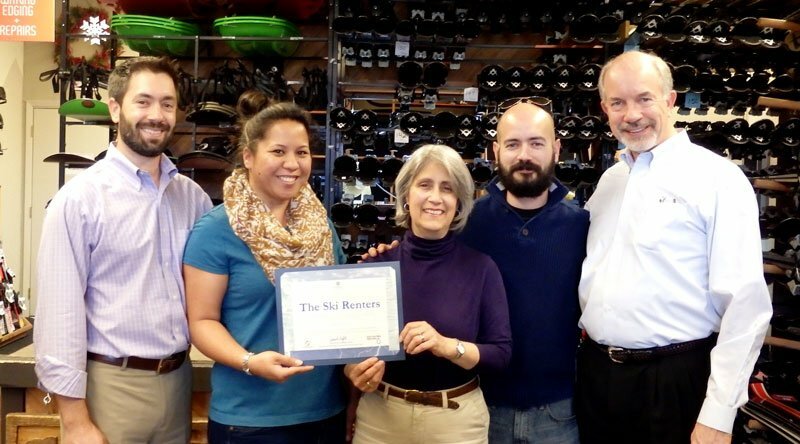 The Ski Renter is owned and operated by the Denise Family; George Sr. and wife Kathy, their three sons George, Jr., Christopher and Michael, and George Jr.’s and Michael’s wives, Dariel and Michal. George Perkins founded The Ski Renter in 1974. There were originally seven locations: Campbell, Mammoth Mountain, Mountain View, Saratoga, Seattle, South Lake Tahoe and Vail. Mike Wampler was one of the early managers, and in 1977 when George Perkins put The Ski Renters up for sale, Mike purchased four of them: Campbell, Mountain View, Saratoga and South Lake Tahoe. Over the next 30 years, Mike sold off three of the Ski Renters, but continued to operate the Saratoga store, which he eventually moved to its present location at 10675 S. DeAnza Boulevard in Cupertino in 2007. In 1993, George Denise Sr. dropped into The Ski Renter in Saratoga to see if Mike would give a presentation on snow sports to his Boy Scout Troop. On the way out, George noticed a “Help Wanted” sign on the front door, so he told his son, George Jr., about it. George Jr. got the job, and over the next fifteen years, at least one of the three Denise brothers worked at The Ski Renter for Mike Wampler. In 2008, Mike Wampler put The Ski Renter up for sale, and the Denise Family purchased it. Today, the store is managed by George Jr.’s wife, Dariel, and the entire family works in the store when they are available and not working their other jobs. It was a natural fit; snow sports are in their blood. George Sr. has been a member of the National Ski Patrol for over twenty-five years, as were sons George Jr. and Chris, serving Tahoe-Donner Ski Hill just outside of Truckee, CA. The entire family also helped lead the local Boy Scout Council’s winter camping program, BearPaw, for the past twenty years. All three sons are Eagle Scouts. It is a family-run business by a family that enjoys skiing, snowboarding, snow camping and the out-of-doors generally, with a long history of community service, and that has been associated with The Ski Renter for the past twenty years. Our goal is to provide the best service to our customers, providing superior snow sports products, and at reasonable prices. "Very friendly, convenient ski rental store." "Many thanks for the help choosing the ski clothes for my boys!" "Friendly customer service and environment!" "Best customer service ever! I was only one in the store, so that helped!" "Great customer service!! Thank you!!" "Great experience. Not too crowded and they had our size!!!" "Amazing service even right before the Christmas rush!" "Everyone was super friendly and helpful!!!" "Great customer service. Very friendly and comfortable interaction." "Pleasant environment and professional services." Spring Skiing and a Sale! Can't get through on the phone? Please email us and we'll respond quickly!